Sorry... 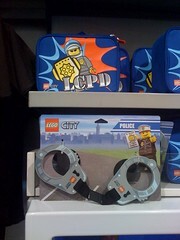 I thought this was a strange thing to find at the LEGO store --LEGO handcuffs... just wrong on so many levels. In other news, the LEGO Imagination Center in Orlando now has new name key chains in stock. It has printed printed 1x1 round black bricks. Haven't figure out what I'm going to do with them yet, but they're neat.